We’re often asked to recommend an inexpensive hotel room for one night near Walt Disney World. If your family is staying at at Disney resort for most of your visit, for example, and you need a place to crash on your arrival night before their vacation begins, you may not want to spent hundreds of dollars on a Disney hotel for just a few hours of sleep. Or if you’ve just finished your Disney vacation and need a bed for the night before your early-morning flight, you could save a lot of money by moving to a budget hotel. 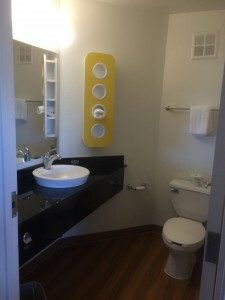 Finding cheap, clean, safe hotel rooms is part of the basic research we do for the Unofficial Guide to Walt Disney World. There’s even a section titled “Top 30 Hotel Deals” that takes price, amenities, and location into account. It’s one of my favorite research projects, and I’ve stayed at more than 100 Disney-area hotels over the years. Only once did I wake up covered in bugs. My “Holy Grail” of hotels is one that’s $50 or less per night (with tax), clean, safe, and where everything in the room works. From what I’ve seen over the past week, though, that room might not exist. Here’s a summary of the 6 hotels I checked over the past 5 nights, along with their pros and cons. Laurel says: I’ll be adding my own asides in this article. You should read them in your head in the voice of your significant other. For perspective, I was perfectly happy with a room I stayed in in New York City once where the sink was IN the shower. Pros: Very clean. Great layout. Best night’s sleep I had the entire trip. $49.49 with taxes. Feels safe. Cons: Sink and toilet didn’t drain properly. Wi-fi didn’t work. Low water pressure in shower. I’ve wanted to stay at this Motel 6 for a long time (“Dream big, Len”, I know). 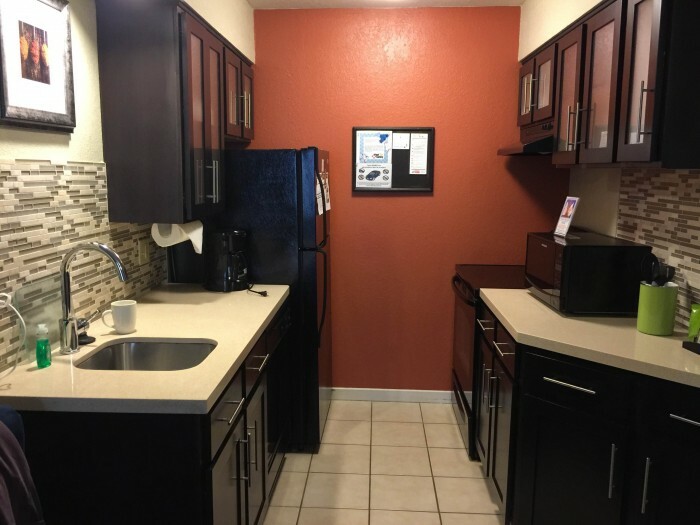 It was one of the first to introduce a new room design across Motel 6’s properties, with triangular bathrooms, hardwood floors, and vertical storage cubbies. Plus it’s really close to Universal Orlando. I was ready to like this hotel. 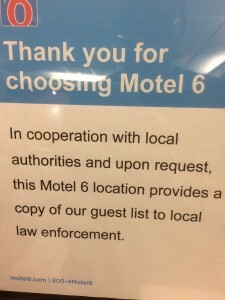 To be fair, it could be that Motel 6 uses this sign to discourage rascals, scoundrels, and really bad eggs from actually checking in, so the place is safer that it would be without the warning. 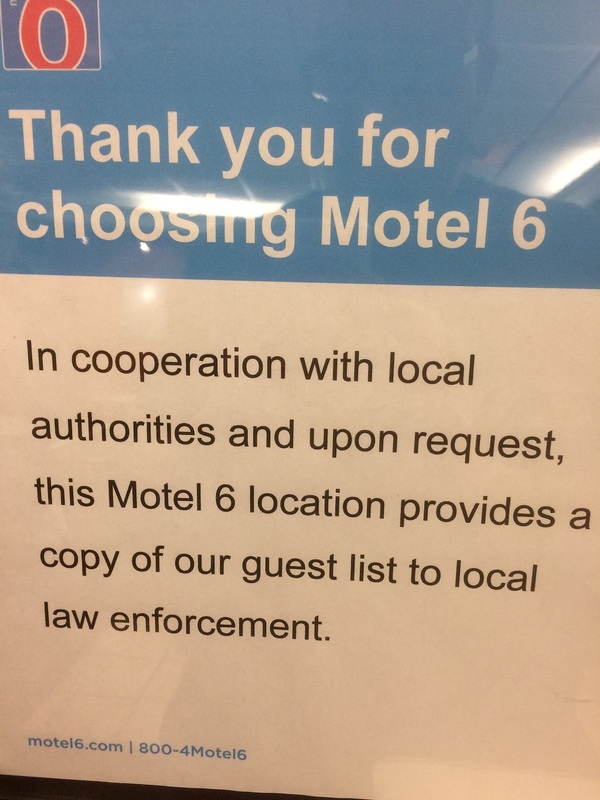 But the first thing that popped in my head was “My God, what happened to make this sign necessary?” Probably not what Motel 6’s marketing department wants. As mentioned above, I couldn’t get the free Wifi to work, the sink took a long time to drain (over a minute when brushing teeth), and the toilet took several tries to flush properly. Water pressure in the shower was adequate for my short hair, but probably not good if you were trying to shampoo some really voluminous locks. Would I stay here again? A qualified yes, if the plumbing can be improved. Laurel says: Other than the musty halls and the making a copy of my driver’s license, this was OK. By OK, I mean I would stay the night here. If I had to spend the length of my vacation here to afford the trip, I would stay home. The room was pretty stylish for what it was. There was nearly no sound-proofing at the Motel 6, or maybe there were banshees down the hall. Being this far down I-Drive is not convenient for visiting Walt Disney World, but pretty good for Universal. Pros: Clean. 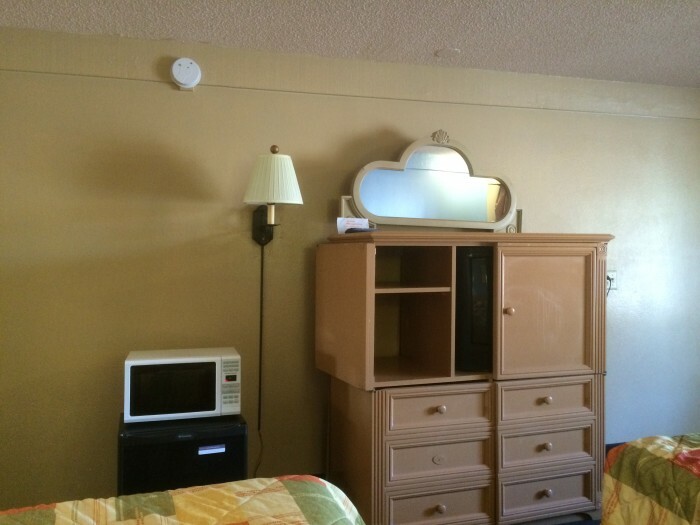 Room included microwave, fridge, and dehumidifier. $65 with taxes. Cons: Door locks have plastic parts and no deadbolt. Exterior door locks felt weak. Hot water took a long time to work. Sink faucet leaked. Noise from I-4. Hey, it’s clean and the Wifi worked better than the Motel 6. But I think the door locks here are a deal-breaker. There’s no deadbolt, and the way you lock the door is by pushing a plastic button that appears to prevent other, also plastic, parts of the lock mechanism from moving. Here’s a photo of the room. Zoom in to see the door for yourself. The whole thing felt insecure enough that when we left the hotel to go to Disney Springs for dinner, we packed up all of our stuff and put it back in the car to take with us. I seriously considered moving the dresser over to the doorway for extra security at night. As it was, I moved a couple of chairs over, so the attack would have been noisy, anyway. Our room was in the back of the hotel, where they apparently don’t put a lot of guests. While you guess which car is ours, ask yourself whether you’d feel safe walking here at night. The good news is that the hotel can add locks pretty easily. There were some minor issues with the plumbing that I’m willing to overlook, such as water shooting out of the back of the sink faucet when I tried to use it. And the five minutes it took to get warm water in the shower. (No kidding – it took long enough that I had already noticed the delay, let it run for another minute, resigned myself to a cold shower, and finally got in.) But would I stay here again? No. Laurel says: The Monumental Movieland felt sketchy and unsafe. I could also hear the traffic on I-4 from the room. Pros: Clean. Almost everything worked. Friendly staff. $44 with taxes. Cons: Dark, musty rooms. No weatherstripping around doors. Unpainted, patched walls. The Knights Inn is where I hit my limit and decided I wasn’t spending the night there. (Actually, Laurel decided for us while I was on the fence. But I’m happy we moved.) Look, the staff that checked me in was very friendly. It’s clearly a family-run business. And it is as inexpensive as hotel rooms come. It’s also very popular – the front desk said they were at almost 100% occupancy the night before and the night I checked in. But it’s not the kind of place that I could reasonably recommend in the Guide, so it wasn’t worth spending the night. Here’s an example of what I mean. The room’s light fixture was clearly installed by someone who wanted to use the absolute shortest piece of electrical wire they could, while still keeping the entire light inside the room. Here’s the dresser, microwave, and fridge. The dresser was unique in that the left door wouldn’t stay closed, while the right door wouldn’t stay open. So there was no way to watch television unless you held the left door open. Sadly, I did not bring duct tape on this trip. The drawers had trouble opening and closing, too. Note the one missing drawer pull. Here’s the sink area. The photos don’t convey how short these cabinets are – only slightly higher than my knees. They’re more like kid-sized sinks. Unfortunately, Disney’s value and moderate resorts were booked solid that night. We declined DVC’s offer of a Coronado Springs room for 24 points plus $95 (about $430 at $14/point). Laurel says: I never thought I’d long for the days of the Motel 6. I was on the phone to Disney trying to get a room, any room, as we were driving up. We literally didn’t think we were at the right place and thought it must be the hotel next door, which ended up being abandoned. That may have been a better choice. What’s a little B&E while on vacation? 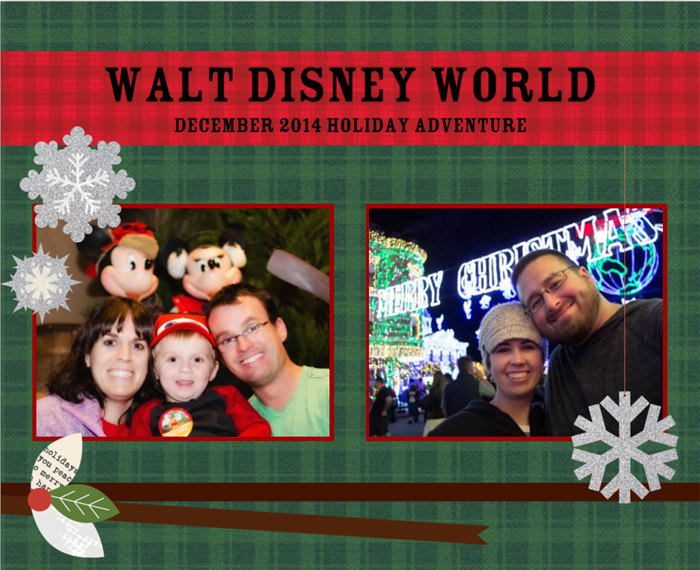 We ended up at Hotel #4, the Wyndham Lake Buena Vista across from Disney Springs this night. It was clean, comfortable, and felt safe. It’s also a very short walk across the new pedestrian bridge to Disney Springs, so it’s got lots of dining options. What I hate about the Wyndham is the additional fees they tack on. The original $89 rate they quoted on their website ended up being almost $129 after adding in a $20 resort fee, $8 more for parking, and taxes. For that kind of money, you can get a 2-bedroom suite at the Staybridge around the corner on Apopka-Vineland (see below). Would I ever stay at the Knights Inn? No. The Wyndham? Not at those rates. Laurel says: I was just relieved we found a place to stay that night. Pros: Very clean. 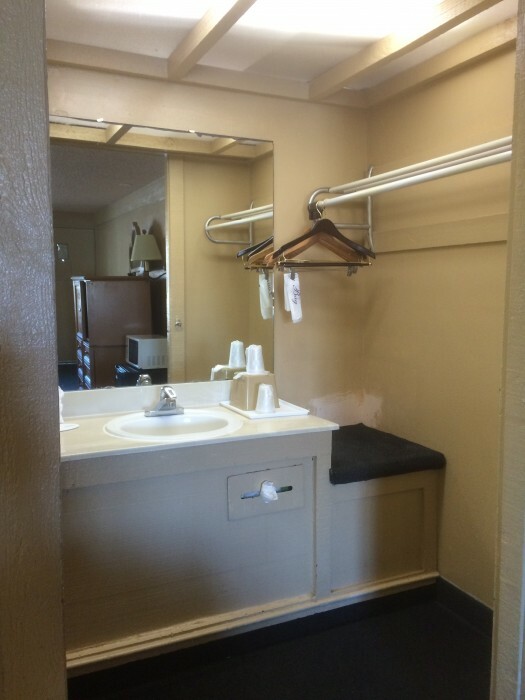 Huge 1-bedroom unit with kitchen and washer/dryer. $133 with tax. 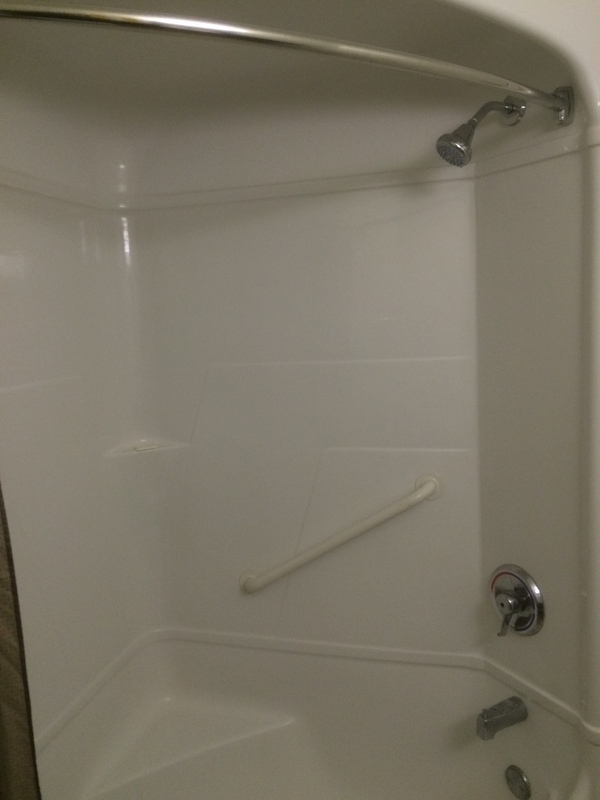 Cons: Shower water pressure could be better. Foam pillows. After skipping out on the Knights Inn Maingate, it was hard to tell Laurel that I chose the Orange Lake resort because readers had complained about its cleanliness. (You can read similar complaints on Orange Lake’s TripAdvisor reviews.) Happily, though, our 1-bedroom unit was as clean as it gets. Everything worked, too, including the washer and dryer, which allowed us to get some laundry done. Our unit had a separate area for the kitchen and for dining, a living room, small hallway for the laundry, and a bedroom with king-sized beds. It was comfortable, too. My only complaint was that the bed pillows were foam, and foam pillows are Satan’s soft goods. Speaking of those TripAdvisor reviews, the Orange Lake resort is a Holiday Inn timeshare, and a few reviews mention some high-pressure sales tactics. We didn’t see any of that – not a single peep from anyone about anything timeshare-related while we were there. It may be possible to get a substantially lower rate if you agree to a presentation, but at $133/night, not much more than you’d pay for a Disney value resort some nights, I’m not sure the presentation is worth the cash. I would definitely stay at the Orange Lake resort again. 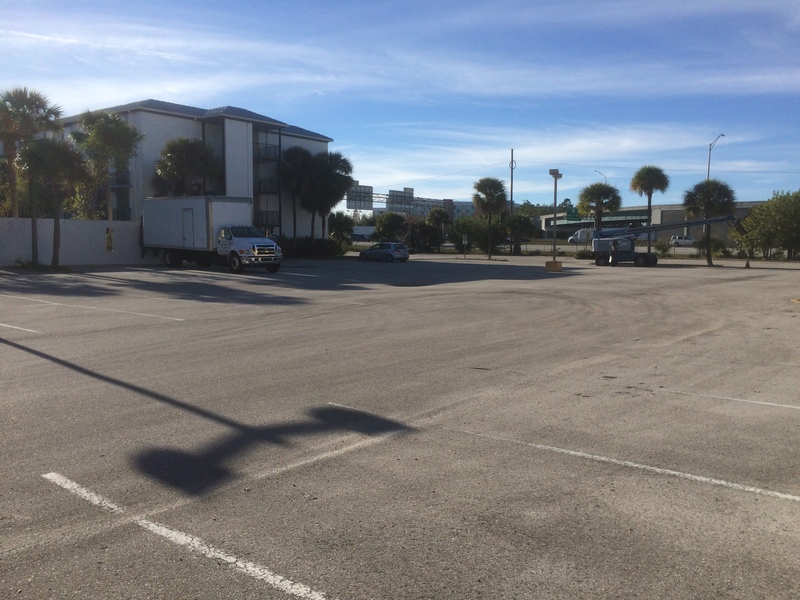 It’s a huge resort – 1.5 miles from the lobby to our room – so you’ll need to have a car. It’s also across from a Super Target shopping center, and less than 15 minutes from any Disney World park. Laurel says: This place was bustling at 4 PM when we checked in. The staff was super friendly. Hopefully the housekeeping problems others have experienced have been addressed by Holiday Inn. Pros: Very clean. Huge 2-bedroom unit with kitchen. Everything worked. TV stations included NY-1. $124 with tax. Cons: Couldn’t find the elevator to our 3rd floor room. I picked this hotel because readers of the Unofficial Guide rated it highly in our most recent survey. With an overall score of 81 out of 100, it’s rated the same as Disney’s Old Key West Resort, and higher than the Walt Disney World Swan and Dolphin; Disney’s All-Star Sports, Movies, and Music, and Disney’s Pop Century resorts, at about the same price point. Here’s a look at the kitchen, which had a full-size refrigerator, electric range, and microwave. The glass-front cabinets hold plates, glasses, and cups, while the lower cabinets have pots, pans, and cooking utensils. The only downside to the room was that it didn’t have a washer/dryer, like Orange Lake did. The Staybridge has an on-site laundry facility, but in-room would have been perfect. And here’s a photo of one of the two bedrooms. The bedrooms sit on either side of the kitchen/living room area. One bedroom has 2 full-size beds, and the other (shown) has a king bed. Each bedroom has its own bathroom, with sink, shower, dressing area, and toilet. 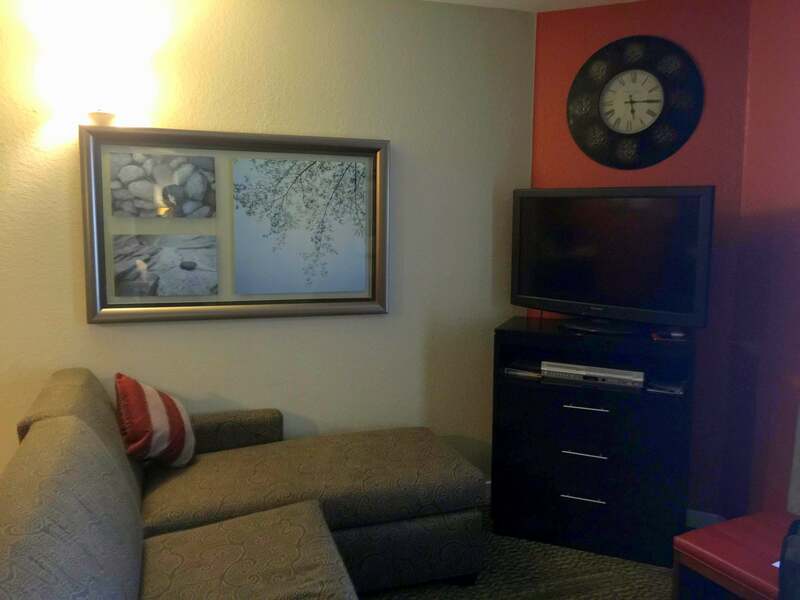 The Staybridge Suites sits between two small shopping centers, both a short, easy walk away. In one is El Patron, a good, inexpensive Mexican restaurant, plus a Chinese buffet and Indian restaurant. The other shopping center holds an ABC store, where you can buy wine and spirits. The Staybridge is also a short drive to Disney Springs. I’m not sure I’d walk to it, but it’s maybe 5 minutes by car. Would I stay here again? Yes. In fact, I’d recommend it over most of the Disney Springs-area hotels because of the amount of room you get, for about the same money. The Staybridge Suites ended up being my favorite resort of the entire trip. Laurel says: The Staybridge is a winner! I would happily stay here again. The location is also a straight shot to Whole Foods on Turkey Lake Road and an easy trip that avoids I-4 to Universal. I’ve got another trip to Orlando coming up in a couple of weeks. Let me know in the comments below if there’s a good, inexpensive hotel I should try. Laurel says: Or let us know if what you really want to know is which Disney Deluxes have the best Club Level service. Please. We live about 3 hours from Disney, and like to make the most of our annual passes by going to the parks several weekends a year. In order to make this possible, we are always looking for a good hotel within a few minutes’ drive of the parks, that can comfortably accomodate the four of us (one of whom is a teenager and has spent her fair share of Disney weekends being squashed onto a double sofa bed with her sibling), without breaking the bank. Tall order, we know! But last weekend we were pleasantly surprised by the Holiday Inn Resort Lake Buena Vista on 13351 State Rd 535. It had a real resort feel with an awesome pool and tiki bar, a little movie theater and kids activities, and an on-site Applebee’s where kids under 12 eat free. We stayed in a Kids Suite, which had a king bed and a bunk bed separated by a wall. The kids loved having their own bed, and we all slept well, since we were able to spread out. The room and beds were clean and had a mini fridge and microwave, so we were able to grab breakfast in the room before hitting the parks (although Applebee’s has a breakfast buffet). We only paid $288 for 2 nights, which was all-in, including tax and the $15 resort fee. I hate paying resort fees, and to me this one went in the “con” column – but since the room was only $124, and one of our kids ate free at Applebee’s, it was easier to stomach. We got to the parks in about 10 minutes – probably quicker than many people who stay at Disney Resorts and use the Disney Transportation system. We were pleasantly surprised, and will stay again! This may be a good one to add to your list! Thanks Christine! There seems to be a lot of good choices in the $140/night range, and a suite is more compelling than a regular room. I’ll add this to the list. We stayed at the Orange Lake resort as a timeshare when we went last April, absolutely no issues with it and it has a little known back road to the disney properties which the Disney dhuttle bus uses. The only issue it has is that it is so big you need a car to get anywhere on it! Thanks Alex! Is the road Western Way? That feels like the middle of nowhere! Thanks for doing this, I’ve never considered staying offsite, but #6 and the Holiday Inn that Christine describes is making me wonder why. I love the point of view of both of you too, that’s a great format. More, please! Club level? Three words: Wilderness Lodge cobbler. And I have to admit that I am the luckiest…my best friend lives in Orlando. Crashing for free is a great value haha. I once stayed at Maingate Lakeside Resort on 192 near Sherberth Rd for around $35/night and was shocked at the (relative) cleanliness and complete lack of violent crime inflicted upon me. Len, lots of suite-style chain places over on Palm Parkway. You don’t find the great off-season values that used to be available, but they’re still a good value if you want to save a little money on a split stay with part of the trip at the Grand Floridian. Avoid the places that still have tube-style TVs, that says something about their investment in the property. My personal favorite over there is the Homewood Suites. Good experiences there. We have also stayed on Palm Parkway with some success. We stayed at the Hampton Inn in that area, which was nice. You’re right, it would make a good “day of arrival” hotel. Or for folks like us who live in Florida but conquer Disney in small bites, and don’t always use all of the other resort features for those shorter weekend trips. I really want to know which Disney Deluxes have the best Club Level service, please. My family and I have been going to Orange Lake for years (since early 90s…. I’m like the Mike Newell of Orange Lake). It’s a beautiful resort with a lot to do. The TripAdvisor complaints are not something I haven’t seen or experienced to some extent, BUT I believe it is one of the best values in the WDW area and I would stay here every time for vacations if I could. The 2BR villas are the bee’s knees, cat’s meow and any other 1930’s reference you can think of. They recently refurbished a lot of them, especially in the West Village and it is divine. Also, the River Island pool complex is quite impressive (and features Starbucks, a Len Testa approved amenity). Glad to see you enjoyed it too. Sounds like Orange Lake’s got moxie! “I’m like the Mike Newell of Orange Lake” Is that similar to being the Scopa of Pop Century? “Fuel up for an exciting day in Orlando with a free breakfast buffet featuring Belgian waffles, eggs, fruit and more.” on the link provided above. We have not stayed at this Staybridge Suites, but have always gotten a substantial breakfast at the Staybridge Suites where we have stayed. How to figure that into the equation? Ah, I forgot to mention that. They also did a wine&snacks reception on our check-in day. I’d say the breakfast is worth somewhere between $5 and $8 per person. Have stayed several times at Comfort Inn on Palm Parkway. Usually under $100 night. Queen beds and free breakfast (including waffles). Just around corner from Disney Springs. Curious about Red Lion Inn & Galleria Palms both on west 192. Both have low rates but very good reviews. If looking to go no frills & low $ (around $50 non peak) we have used Super8 on east 192 across from Old Town, clean and comfortable with queen beds. Loved this article! We have done on/off property about 50/50 for our vacations, but lately we have been squeezing more “budget” trips in by staying off property. We have used hotwire or priceline mostly, and ended up staying twice at the baymont inn and suites in celebration for about $70/night after fees. 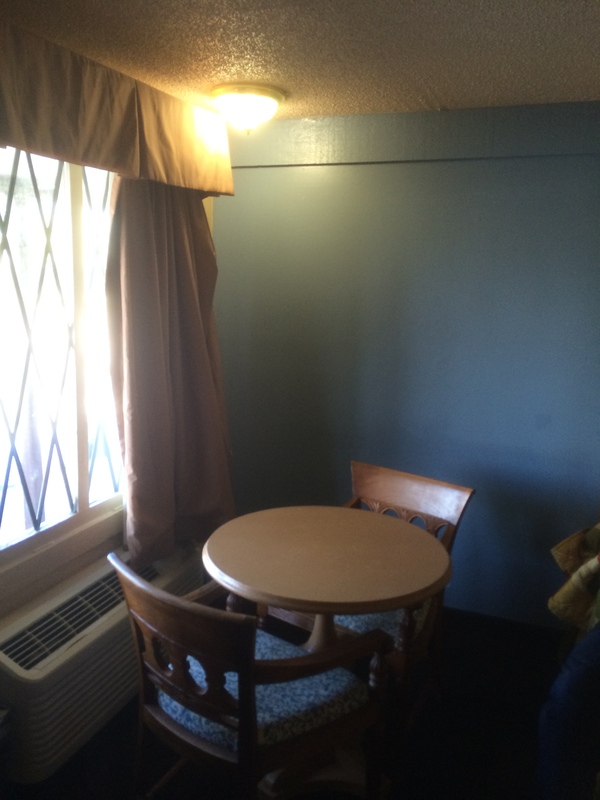 The rooms are very clean, come with a fridge and microwave, and the lobby is beautiful. It has a nice little gift shop in it. Breakfast is just ok, but it’s complimentary… so I’ve never complained! We also spent one night in Seralago for about $50 for the night. The rooms were not as nice as the Baymont, and definitely had a two star feel, but ultimately were clean, and the beds were comfortable enough. The staff was extremely friendly as well. When a friend announced her wedding in Orlando two weeks after our Disney Vacation in May, we stayed at the Destiny Palms hotel for $42/night (hotwire rate) on a weekend. That was also a very nice hotel- rooms were clean (albeit quite small) and staff was friendly. I was raised travelling with my parents and only ever staying in Hampton Inns, so I have a pretty hard time staying in 2 star hotels. While these hotels don’t quite match up to a three star hotel in my opinion, they are very comfortable and clean, allowing me to still enjoy my trip and not go home with an incredibly high credit card bill. One final suggestion (although I’ve heard you mention this in other reviews so I’m sure you’ve stayed here) are the Sheraton Vistana Fountainview suites. I fell in love with those on our trip in May- we stayed for a little over $100 per night and the suites were absolutely gorgeous, and right around the corner from Disney. The full kitchen is extremely helpful with little kids- thus far it was probably the best “hotel” experience we have had that was not on property. Correction- Baymont Inn and Suites was $35 dollars per night ($70 for two nights)- very good bargain for how nice the room was! You can actually see Expedition Everest from the top floor of the rooms. Thanks Rachel! Our statistician Steve has good things to say about the Baymont too. And I’ve got a friend going to the Destiny Palms in April, so that’s good to hear too. I stayed at the Baymont Inn for my first Disney trip. They hold a church service every Sunday morning in a conference room, and whoever preaches that week gets a free week at the hotel, which my dad did. My biggest thoughts were how inconsistent it was! I stayed in the room with my mom, and some days they would make my bed and not hers. On different days we got 2, 3, or 4 towels. But the worst… our final night we came back to the hotel room, and well, there’s just no nice way to say this! Someone had pooped in the toilet while we were gone for the day! 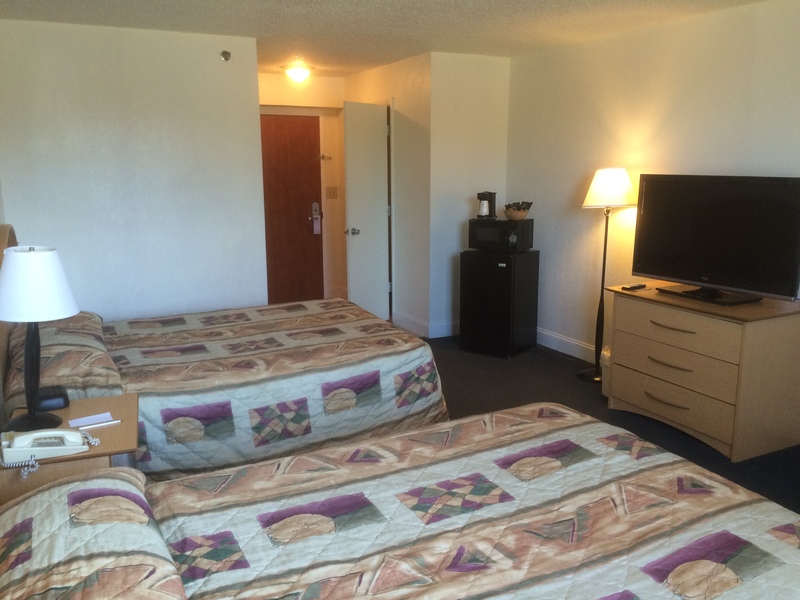 Try the Rodeway Inn just off of 192 for a really cheap room. I think it is typically under 30 a night. I have been pleasently suprised staying there. Clean rooms but fairly worn. In my mind a pretty decent value pick. From reading this, I’m not clear on why the Knights Inn Maingate Kissimmee (which had minor broken furniture in the room) was bad enough to leave while the Monumental Movieland (which made you feel unsafe) was not. Although it’s been several years since I was there (back then, its refurb was recent), I’ll add another vote for Baymont Inn & Suites. Great location and can be very cheap. I’ve also stayed at Destiny Palms, which was fine. It’s not super-close to WDW, but there are some advantages to that–like the adjacent McDonald’s had normal (rather than “gouge-the-tourist”) prices. Oh the Knights Inn definitely felt unsafe too. The door wasn’t secure and, as a motel, was completely exposed – unlike the Monumental Movieland where miscreants would have had to break a glass door to get into our hall. Osceola County is attempting to clean up this part of 192. It took a big hit in the 2008 recession and hasn’t bounced back. One more thing I will add is if you are gunning for $50/under, the X-factor to consider is Priceline. You can net hotels that usually go for $75-100/night for around that $50 mark. YMMV with Priceline, but it really does a good job of finding deals. We stayed at Mystic Dunes on a Hotwire rate. Less than $50 a night for a 1 bedroom suite. It was nice and very close to Disney. I haven’t tried Hotwire yet, but that’s definitely an option. Thanks Felicia! My question for those getting into the $120 and up price range is why not rent a condo or townhouse at Windsor hills? Vacation rentals are such a good deal in this area I can’t imagine doing anything else for a multi day stay unless you are staying onsite. My thoughts exactly. For $100/night we can usually find a 3br/3ba townhome with private pool, full kitchen and living room. Why anyone would want to stay in a one bedroom one bath hotel room with just a microwave and minifridge for 100+ is beyond me. This is a legit option. I agree. Thanks Ben! I looked at Windsor Hill and was super excited to stay there until I checked out the cancellation policies. Most of these owners won’t give you anything back (which I understand as they are not large corporations.) However, being a family with kids there is always the chance we will have to change or rearrange things at the last minute. My hotel would only take one night’s lodging vs. the entire stay. Granted trip insurance may help cover this cost, but would be the only reason for us to buy that insurance. Also, the owners have vastly different policies about how much money they will hold for “damages.” Again, necessary for them but a real hassle for me, and each owner has a different idea of “damages.” So all in all it wasn’t as clear cut of decision as just the price and extra room. Hi Len. Hi Laurel. Great topic, thanks. We’ve stayed at Courtyard marriott village for may years, anytime not staying at Dolphin. Averages about 100-120 night- that includes tax, parking fee. Varies depending on discounts used, day of week. It’s a fancier that usual Courtyard with a really nice pool, restful pool setting. I actually enjoy the peacefulness there, although love the fun atmosphere of staying at Dolphin. This april we’re doing a split stay, since school vaca week prices at Dolphin were a sticker shock. I like that the Courtyard still feels a bit special, so we don’t feel so missing staying onsite. It’s a quick drive to the park, about 15 minutes or so. Hi all, thanks for the reviews. We live 3 hours away, frequent AP holders. We have a new baby and are considering a weekend trip in April. 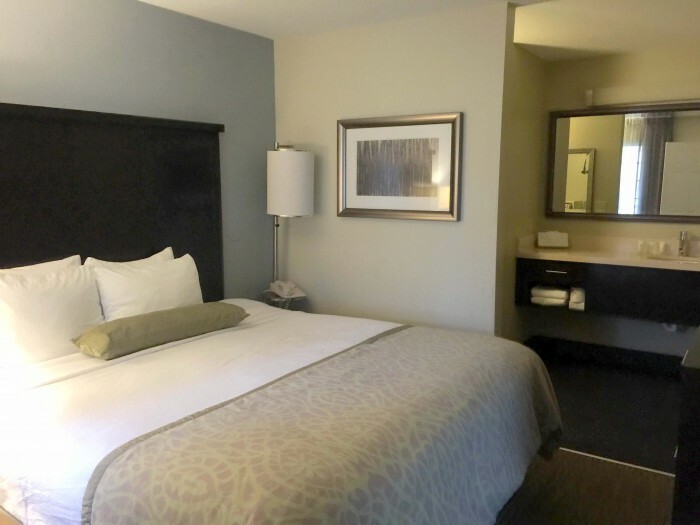 You put the Staybridge Suites on my radar – baby goes to sleep at 6:30/7pm, so if we’re all in one room we’re going to be spending a couple hours sitting in the dark in silence while he sleeps, so a suite is ideal! My concern about the Staybridge is having to deal with Disney Springs traffic – did you find this to be a problem going to and from the parks? Worse in the evening? Close enough to take a midday break? It’s not worth it to me if I have to spend 30 minutes stuck in traffic coming back from the parks. Thanks. You have a couple of driving options. For Magic Kingdom and Animal Kingdom, it may be fastest to take I-4. Google Maps is telling me that it’s around 16 to 20 minutes one-way right now, excluding traffic. That’s also the way that taxi drivers would probably recommend. For Epcot and DHS, we had luck taking Hotel Plaza Boulevard to just past the Wyndham, then turning right on to Buena Vista Drive, then left to Disney Vacation Club Way (the road that Old Key West and Saratoga Springs are on). From there you can follow the signs to the parks. That gets you around all of the Disney Springs construction. It adds 5 minutes to your trip, but lowers the chances of getting stuck in that construction traffic. This is article is very interesting to me but it doesn’t sound like it was the best research trip for both of you. The conclusion that I’ve drawn from reading the post and comments is that there is no safe hotel at a $50 price point. It seems like one would need to double that amount. If that is the case then why not choose a Disney value resort and take advantage of their benefits like free transportation, extra magic hours, etc. or consider a small rental property?